Businessman Greg Vital said TVA employees, "accompanied by an armed guard, for the first time today entered the private property it intends to take using government’s power of eminent domain in Georgetown." Mr. Vital filed suit in Federal Court to try to block TVA from coming across his Meigs County farm. TVA said it is along the route for a new high-voltage line leading to a planned $300 million power center. Judge Sandy Mattice ruled in favor of TVA. 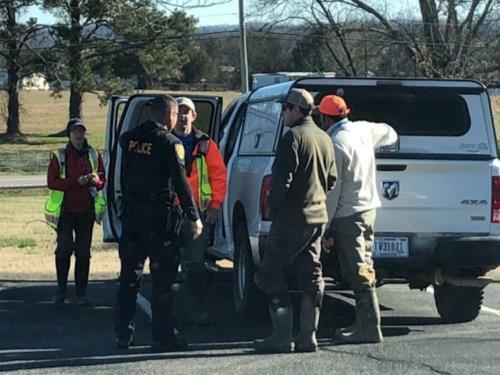 Mr. Vital said, "The four-person environmental study team from Knoxville crossed Highway 60 from its substation at 12:50 p.m. after spending two hours walking along the existing TVA right of way. The group walked one of the four proposed routes by TVA and crossed Gunstocker Creek on to the Project Viper site at 2:35 p.m.
"The TVA employees said they were not conducting tests but were seen taking core samples along the route. They said their mission was only to observe the “natural features” of the land. The armed guard would not specify where he was from, only that he was from 'Hamilton.' "
“This was the third team that has been in Georgetown but the first to enter the land TVA is taking,” said Mr. Vital, one of four property owners currently in federal court, who talked with an employee who followed the TVA team. “The first two were TVA contractors, and they were friendly and engaging, willing to answer questions. Mr. Vital said, "TVA is building a $300 million secret complex in Georgetown to house the power control center for the TVA power grid. The agency misled citizens and elected officials in August and tried to hide what the development was. The TVA has refused to hold a public meeting in Georgetown to address citizen concerns. "In November, after failing to negotiate in good faith and before notifying property owners, TVA went to federal court in Chattanooga filed a “quick take” eminent domain action to give it immediate access to the land. Property owners hired lawyers and sought to set aside the order, but Federal Court Judge Sandy Mattice said the power of the 1933 TVA Act and the evolution of the law over decades prevented him from acting. 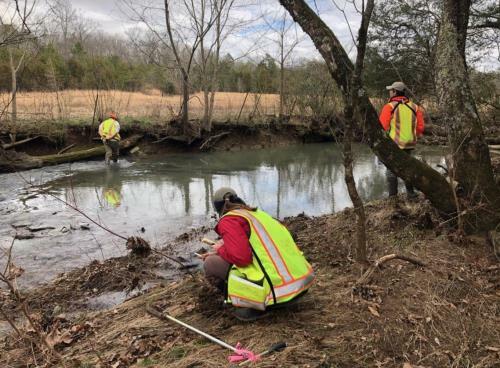 "The TVA archeological contractors will enter the condemned property tomorrow, including an inspection of Gunstocker Creek where they anticipate finding Indian artifacts. The TVA employees did not answer when they would return to the property to continue its environmental study, which is a process mandated by the National Environmental Protection Act and other regulations of the Environmental Protection Agency." Mr. Vital has set up a Facebook page and website. They are facebook.com/4TNfarms or www.4TNfarms.com.